uChineseCheckers - a fun game for Windows by NIX Solutions. uChineseCheckers is a strategy board game which can be played by two, three, four, or six people, playing individually or with partners.The aim is to race all one’s pieces into the star corner on the opposite side of the board before opponents do the same. The destination corner is called home. Each player has 10 pieces. In “hop across”, the most popular variation, each player starts with their colored pieces on one of the six points or corners of the star and attempts to race them all home into the opposite corner. Players take turns moving a single piece, either by moving one step in any direction to an adjacent empty space, or by jumping in one or any number of available consecutive hops over other single pieces. A player may not combine hopping with a single-step move – a move consists of one or the other. There is no capturing in Chinese checkers, so hopped pieces remain active and in play. Turns proceed clockwise around the board. A basic strategy is to create or find the longest hopping path that leads closest to home, or immediately into it. (Multiple-jump moves are obviously faster to advance pieces than step-by-step moves.) Since either player can make use of any hopping ‘ladder’ or ‘chain’ created, a more advanced strategy involves hindering an opposing player in addition to helping oneself make jumps across the board. Of equal importance are the players’ strategies for emptying and filling their starting and home corners. Games between top players are rarely decided by more than a couple of moves.Differing numbers of players result in different starting layouts, in turn imposing different best-game strategies. For example, if a player’s home destination corner starts empty (i.e. is not an opponent’s starting corner), the player can freely build a ‘ladder’ or ‘bridge’ with their pieces between the two opposite ends. But if a player’s opponent occupies the home corner, the player may need to wait for opponent pieces to clear before filling the home vacancies. Follow our development team to get the latest apps’ updates on @NixS_idev. 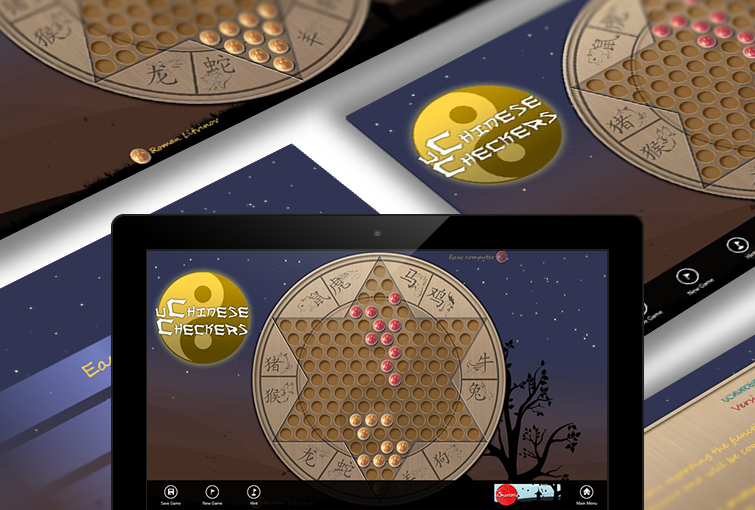 Download uChineseCheckers right now from Windows Phone Store!